chance to review Candace Calvert's latest book due to be released early next year. I first came across Candace's books at the library but was super hesitant to start reading them as I'm not a fan of hospitals/medical procedures and the books are all set around hospitals. I watch two medical TV shows Scrubs and Saving Hope and that's because the general medical stuff happens in the background and the shows are based around the characters. We had previously been introduced to Sloane in her last book Step By Step, so we know a bit of her background and what made her leave her last hospital. While you can read Candace's books in any order, I would recommend that you read Step By Step before you read Maybe It's You just so you have a bit more understanding about her past. Maybe It's You also includes a cat, Marty which ups the cute factor in this book (can more books includes cats please!!!). One thing I really loved about Maybe It's You was that none of the main characters were perfect, in so many Christian books the main characters are seemingly perfect and its how they deal with their struggles - which isn't a bad thing just not that relatable in this day and age. Where as these characters are each dealing with their pasts and how that made them see themselves in the present day. Sloane has lived in fear for so many years and now she finds a place where she wants to stay and things are holding her back from opening up to people and putting down roots. Sloane has never had it easy and we can see how that affects her judgement and how willing she is to trust people. At the beginning of the book Sloane takes comfort in knowing that she has rescued her cat Marty and believing that she can rescue herself. 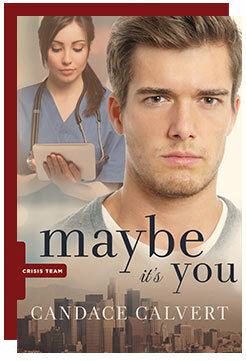 Throughout the book she begins to slowly realise that she may need people (and God) to help rescue her. I loved the storyline and how the characters just wove together with it beautifully, the love of God also shone through. I am all about the characters when it comes to books (and movies and TV shows)and they need to have good chemistry the characters were amazing and just connected so well together, I just love how even small characters were connected in with the book perfectly. I read so many books and at least half the books I read are Christian Fiction so I know this genre and these things really made the book stand out for me. I would probably compare Candace's style to Dee Henderson's (but not as dark) with a dashes of Jenny B Jones, Rachel Hauck and Denise Hunter so if you love those authors then definitely read her books. Maybe It's You gets released on the 7th of February and its well worth the wait! You can pre-order it on Amazon, Book Depository, Koorong, and where all Christian books are sold. *For those wondering how accurate the medical side of things is while I am unable to personally comment on it, Candace was an ER nurse for many years and has used her own experiences during that time in her books. So for me coming from a non medical I felt that it was accurate from what I have heard and seen, but if you do have a medical background its up to you to decide. **I was provided with a temporary EPUB copy of Maybe It's You in exchange for an honest review, all opinions are 100% mine.